By now, most of you know what a huge NASCAR fan I am. But did you know that teammates Dale Jr. and Jeff Gordon are two of my all-time favorite drivers! It has been a pretty good 2012 for this NASCAR fan. However, it did not prepare me for today. The U.S. Mail service brought me an awesome new green Dale Jr. hoodie. Now, I was expecting this attire. However, the mailperson also brought me a package from an unexpected source. The big box contained a Dale Jr. backpack; spy sunglasses; a Dark Knight Rises #88 Diet Mtn. 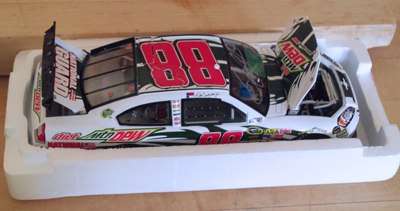 Dew cap; and my favorite, a Hendrick Motorsports #88 Diet Mtn Dew 1:24 Scale Stock Car, Limited Edition Adult Collectable! Now while I was counting my blessings, in the back of my mind, NASCAR Race Mom lamented the fact that I still did not have that coveted Dale Jr. autograph. Then in a "real-life is stranger than fiction moment," my husband Paul walked in with a huge box the UPS man left. Doesn't NASCAR Race Mom look happy! Believe it or not, the box housed a beautifully framed AUTOGRAPHED photo of Dale Jr.! Not sure what NASCAR Race Mom did to deserve all this special attention from Dale Jr. However to say I am appreciative would be a huge understatement. 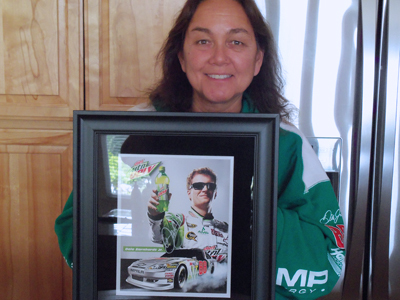 NASCAR Race Mom is honored to be a member of the Dew Crew!